ORLANDO, FL. — Former NFL star, Archie Manning, has been named the keynote speaker at the Southern Exposure council’s 2015 conference and trade show. The event will be held on Feb. 26-28, 2015, at the Caribe Royale All-Suite Hotel & Convention Center in Orlando, FL. Manning will deliver the keynote address Saturday, Feb. 28, during the luncheon and general session. Source: The Produce News. 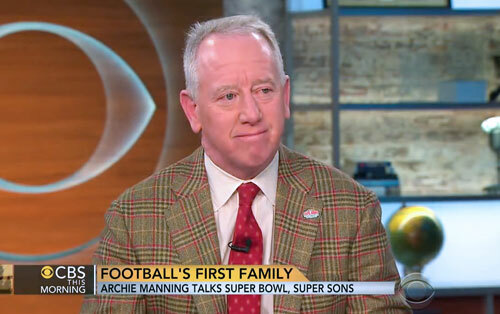 Photo shows Archie Manning in Jan. 2014 speaking with CBS about his two sons Peyton and Eli. Watch Archie Manning speaking with CBS Jan. 2014 about Peyton and Eli. Archie Manning is a two-time Pro Bowl selection. He played for the New Orleans Saints from 1971-82 and was considered one of the top quarterbacks of his generation. He is the father of Giants QB Eli Manning and Broncos QB Peyton Manning. He was selected Father of the Year by the National Father’s Day Council, and he currently serves in PR and consulting capacities for several local, regional and national companies. His community activities include the Louisiana Special Olympics, the New Orleans Area Boy Scout Council, the Salvation Army, United Way Speakers Bureau, Allstate Sugar Bowl Committee and the New Orleans Sports Foundation. Sports Speakers 360 is a booking agent for pro athletes. If you would like to book Archie Manning for a speaking engagement, appearance or endorsement, contact Archie Manning’s booking agent for fees at 1.855.303.5450.